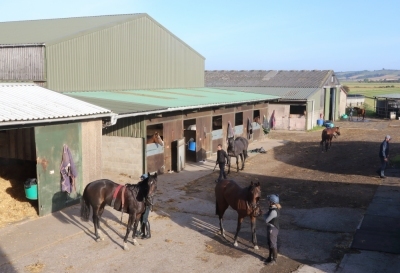 Situated in Ryedale, one of the most beautiful parts of the north of England, Mick Easterby Racing is able to provide a complete service to anyone interested in owning a racehorse. 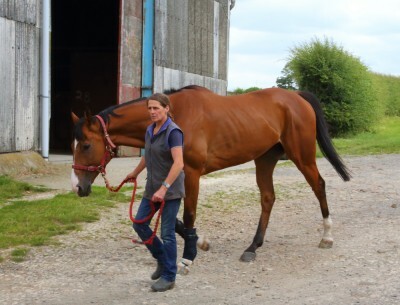 The service includes buying horses on behalf of owners, in addition to training horses brought to the Easterby stable. 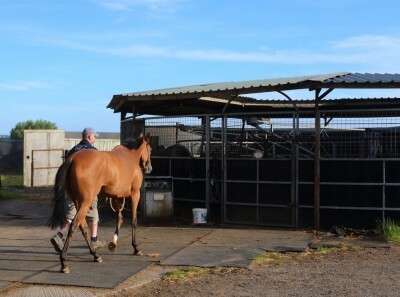 Buying talented bloodstock is one of Mick's key strengths as he and his assistants have amassed considerable knowledge and experience at buying yearlings - Mick has been buying horses for over sixty years, having started by buying and selling hunters in the 1950s. An important part of our training philosophy is to treat each horse as an individual. Every horse has his or her own character, just like people do. Therefore the needs of each must be catered for to get the best out of the horse. 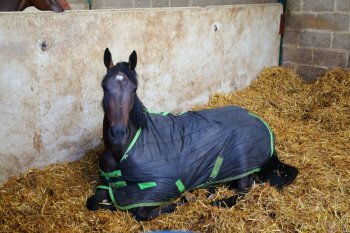 Just like people, some horses are early risers, and need to be out of their boxes and on the gallops first. Hoof It and Bowson Fred are usually among the first out - they like to be up and about early! We usually start about 7:00am. The horses are given their breakfast and exercised (Monday to Saturday). Sunday's the day off except for horses running the following day. 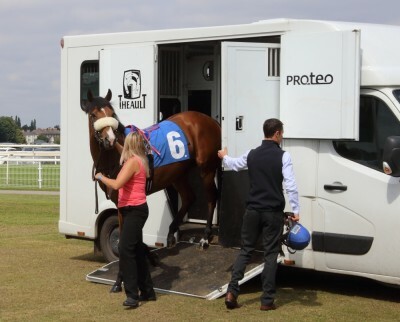 Horses travelling long distances, such as Ayr, will have been fed earlier, about 5am, and loaded for their journey. Horses are taken out in groups of upto five or six. The combinations depend upon the horses, some work well together, some don't! Hoof It likes to go out on his own or with a lead horse. Others work better together, for example the juveniles need to get used to running alongside other horses. They are cantered and galloped throughout the morning, with the staying horses using the steep uphill all weather gallops to build on their stamina. The early shift will leave the stable about 12:30. The stable is virtually self sufficient in its feeds, as most is grown on the farm. Only nuts and sugar beet pulp are bought in. The horses are fed at 6:30am, get a light lunch at midday and a main meal by 6pm. And we have to be on time! After tea the runners from the day start returning from the racecourses. They wind down and are fed, then its off to bed. Its another early start tomorrow! Starts with a light breakfast of hay as the staff feed the horses before taking out the first lot. The horses are tacked ready for the first lot to go out. First lot heads for the gallops while some of the other horses are on the walkers. Joanna Mason takes She's Awake on the uphill gallop. Horses are exercised on the flat gallop. Wash down before going onto the horse walker. Horses are also exercised on the horse walkers. After a workout the horses go onto the horse walker to warm down. Other horses in lighter work are just exercised on the walker this morning. 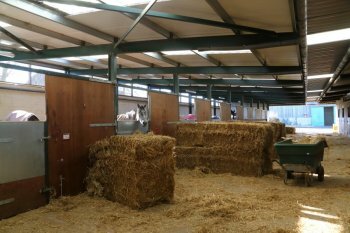 Our horse walkers are covered and two are also indoors to ensure that bad weather does not make it uncomfortable for the horses. 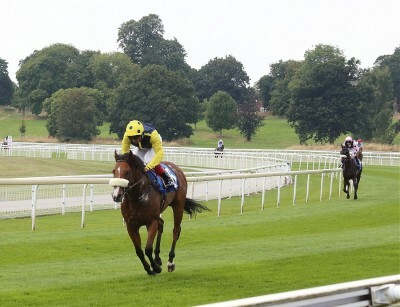 Horses that are racing today will be leaving the yard. 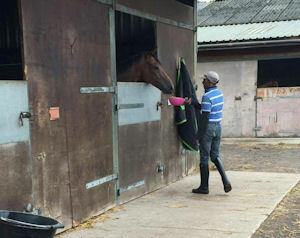 The time that they leave will depend upon distance travelled, horses running at courses a long way away often leave the day before and stay overnight at the racecourse stables. Another lot are saddled and taken out on the gallops. Up Ten Down Two comes back up the uphill gallop with Janice riding. Arrowtown gets a drink and a wash down after exercise then its onto the walker. 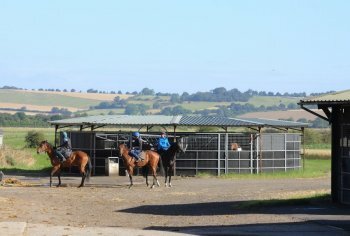 Its a busy scene at the bottom yard as horses return from exercise and horses are tacked up ready to go out. Joanna, Serena, Craig and Mark all have their hands full! 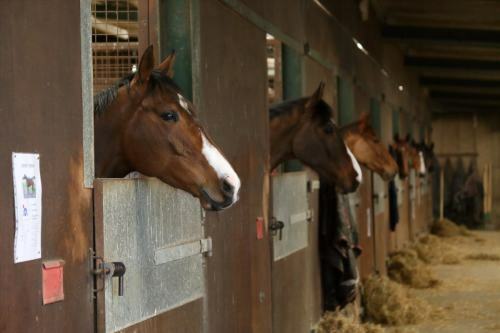 After exercise the horses can relax in their boxes or in the paddocks. 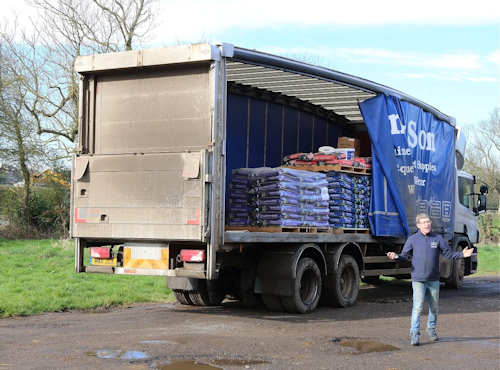 The feed lorry has arrived. McIvor's deliver our racehorse cubes. Much of the other food is home grown. We feed the racehorses oats that are grown on our farms, only the best will do. Some of the horses are having time in the paddocks to unwind after his morning exercise. 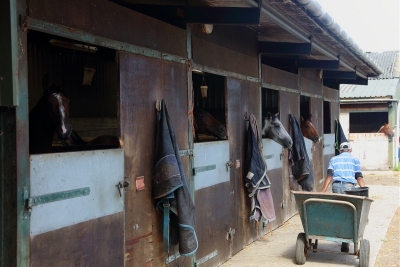 The horses get a light lunch, and while they munch away the early shift leave the yard about 12:30 pm. The horses will then relax until its time for their main meal at 6pm. During the afternoon other tasks such as vet's visits, shoeing etc will be undertaken. 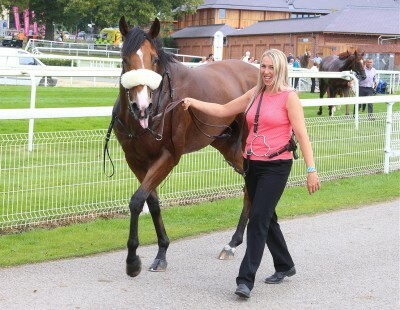 Our runners are arriving at the racecourse, today it is York. This is Bowson Fred. He has been boxed across from the racecourse stables to the course with Hoofalong by Katie, Craig and Ryan. 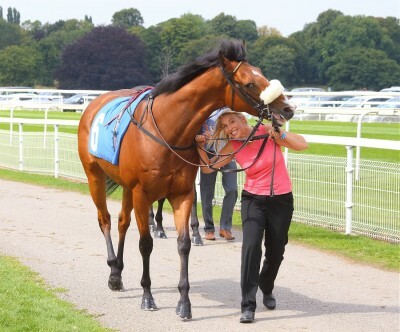 Katie leads Fred into the racecourse and the parade ring. 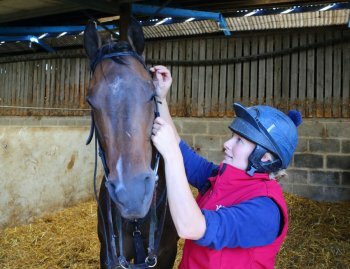 He has been saddled at the racecourse stables. 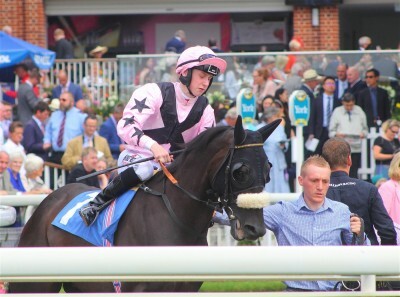 We have two runners in the 1.55 at York. 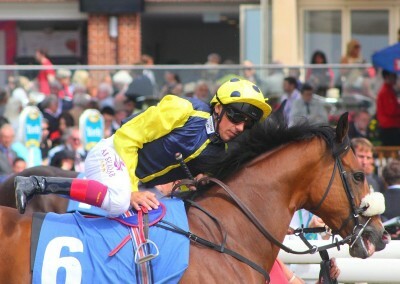 Frankie Dettori climbs aboard Fred to take him down to the five furlong start. Hoofalong follows Fred and Frankie to the start. Our runners head back to be unsaddled and have a drink of water. The horses return to the horsebox for their journey home. This is Katie with Bowson Fred. The horses are loaded into the box safely and securely and ready to head back the short trip from York Racecourse to Sheriff Hutton. We'll be home in time for tea! 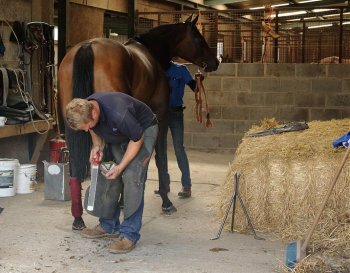 Meanwhile back at the yard, and away from the excitement of the racecourse, Richard Clark, the blacksmith, is busy shoeing. The oat delivery has arrived. 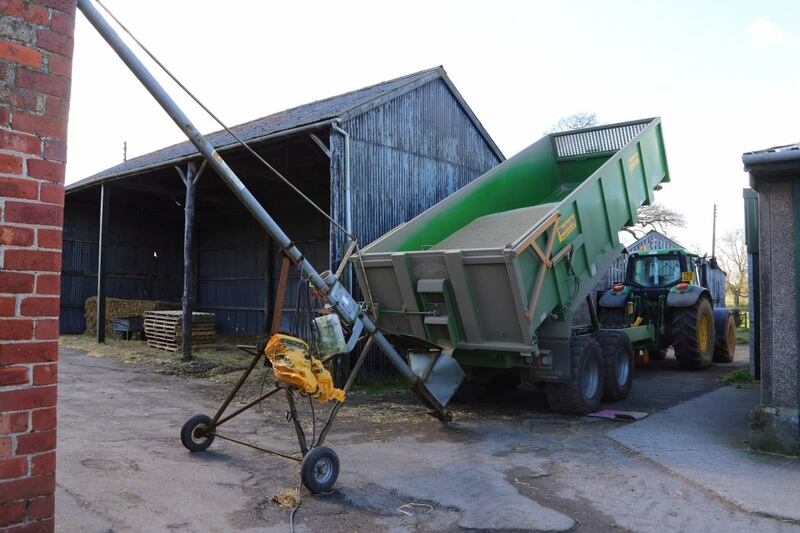 Once a month we move about ten tons of oats from our farm stores to the yard. 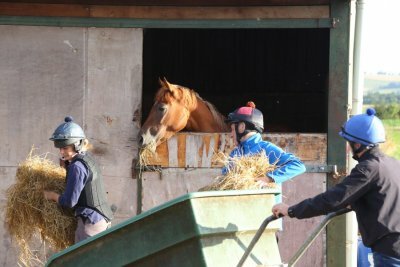 Our top quality home grown oats will give the horses part of the nutrition they need, along with the racehorse cubes that arrived earlier and the hay which we also grow. Horses that have been out in the fields during the day are brought in for their evening feed. Tea time is approaching and the horses know it. They are patiently looking out for the feed cart! The feed cart appears and the horses are ready to have their main meal then its bed time! Happy horses, the evening meal has arrived!